Euchre is designed primarily for four players where two players form a partnership against the other two partnered players. This game has many variations, including versions where other numbers of players can play, and some where competition for money is involved. While Euchre has declined in popularity in the United States since the early 20th Century, it remains popular in other parts of the world such as Canada, the United Kingdom, New Zealand, and Australia in particular. A Euchre deck is similar to a standard 52 card deck except that 2-8 of each suit is removed, leaving a total deck of 24 cards. Some variations will expand the Euchre deck to include both the 7’s and the 8’s as well, putting the deck at 32 cards, and other variations have specific rules that introduce the play of the joker card, which was reputedly first introduced in 1840 into playing card decks as a result of these variations of Euchre. Euchre consists of playing repeated hands of cards until one partnership scores enough points to win the game. Each hand consists of three parts: the deal, the calling round, the playing round. Whether you play with the standard 24 card deck or the 32 card variant, the deal proceeds with a dealer being chosen initially and after each round the deal moves clockwise (to the left) to the next player. Some people will play a variant that involves “stealing the deal.” This happens when the partner of the person who dealt the last hand picks up the cards and starts shuffling. The player can have successfully stolen the deal if the opponents do not notice or complain, but if they do notice, the deal returns to the correct dealer with no penalty for the unsuccessful deal thieves. The dealer can then deal out one to four cards at a time to each player, alternating if she or he chooses. The deal must go around twice, however, and each player must have five cards in the 24 card deck game and seven cards in the 32 card deck version. In either case, four cards will remain, which should be placed face down in the center in front of the dealer. These four cards are called the kitty. Once the dealer has dealt out all the cards, the calling round, in which the trump is determined, begins. 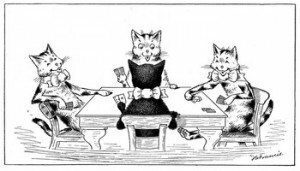 The dealer will turn the first card in the kitty face up. Starting with the player on the dealer’s left, each player has an option to agree if the suit of the face up card should be trump. If anyone decides it should be trump, that person tells the dealer to “pick it up.” If the dealer has to pick up that card, he or she must discard one other card back to the kitty face down. The suit of the card the dealer picked up becomes the trump suit and the person who told the dealer to pick it up has to win the majority of the tricks with her or his partner’s help. If a player does not want to choose the face-up card to be trump, that player has an option to pass. Once all the players have passed once, the dealer can then ask the player on the left to pick a trump suit. That player can do so or pass. If all three players before the dealer pass on this option of naming the trump, you can play a couple of different ways depending on your house rules. One option is to declare a misdeal in which all hands are discarded, and the dealer shuffles and deals again, beginning the bidding sequence over. A second option requires the dealer to name the trump. In either case, whichever partnership has named the trump has to win the majority of the tricks. Once the trump has been decided, the player to the left of the dealer plays first by laying a card in the center face up. A player can lead any suit and play proceeds clockwise with each person playing a card until all four have played. Each player must play a card within the suit led if they have it. If they are out of the suit that was led, players may play any card from any other suit, including the trump suit. If trump cards are played, the highest trump card wins that trick. If no trump card is played than the highest card from the suit that was led wins. In Euchre, the Ace is the highest card from each suit, followed by King, Queen, Jack, Ten, and Nine. There is one important exception to this however. In Euchre, the highest card in the trump suit is the Jack of that suit, called the Right Bower, followed by the Jack of the same colored suit, called the Left Bower, and then it proceeds in order from Ace to nine. Consequently, if the suit of hearts was named the trump suit than the ranking of that suit would be as follows: Jack of Hearts (right bower), Jack of Diamonds (left bower), Ace of Hearts, King of Hearts, Queen of Hearts, Ten of Hearts, and Nine of Hearts. Play continues with each person who wins a trick keeping those four cards stacked neatly in front so that it is easy to determine how many tricks she or he has taken. The object is for the side that called the trump suit to win the majority of trumps. If they do so by taking 3 or 4 tricks (in the 24 card version) or 4-6 tricks (in the 32 card version), they receive 1 point. If they take all 5 tricks (24 card version) or all 7 tricks (32 card version), then they receive 2 points. There is a special situation during the bidding stage where the player who is naming the trump card can declare that he or she is “going solo.” If this happens, that player’s partner will discard her hand into the middle, and the declaring player attempts to win the majority of the tricks by himself. If the player going solo wins the majority of the tricks, his partner and he get 1 point, but if he takes all of the tricks, his partner and he score 4 points. In the Australian version, the first partnership to 11 points wins, and in some games, that partnership must win by 2 points in order to end the game.